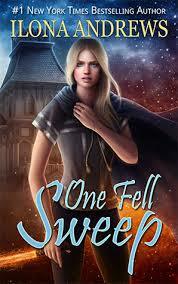 Review: One Fell Sweep concludes the Innkeeper Chronicles and while I didn't enjoy it quite as much as the previous installments, it was still a really good read. Dina enlists Arland's help rescuing her sister, Maud and her young niece. I absolutely loved Arland and Maud and seeing their relationship develop. Arland is so funny and his uncle questioning Dina about her sister's history was very great. I loved Dina and Sean (especially the meet the parents scene). The primary conflict in the book is when Dina agrees to help a guest save his civilization and she is targeted by assassins. I found her guests pretty much devoid of personality and I wasn't as invested in that story line. Overall, really good read and fabulous series.